From Dr Weston Price. Nutrition and Physical Degeneration 1939, 1945 pp 400-402 APPLICATION OF PRIMITIVE WISDOM. Dr Price, a dentist, is one of the founding fathers of modern nutrition. In Africa I found many tribes gathering certain plants from swamps and marshes and streams, particularly the water hyacinth. These plants dried and burned for their ashes which were put into the foods of mothers and growing children. A species of water hyacinth is shown in Fig. 130 (click). The woman shown in Fig. 130, with an enormous goiter, had come down from a nine-thousand-foot level in the mountains above Lake Edward. Here all the drinking water was snow water which did not carry iodine. 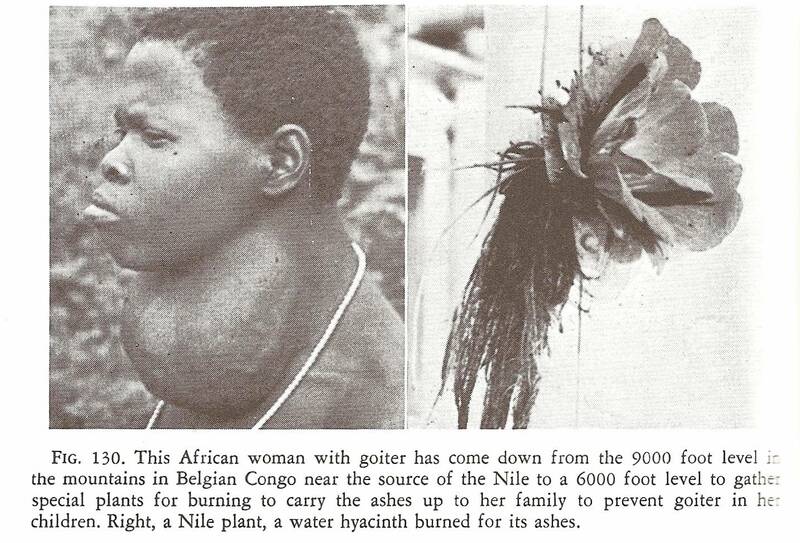 She had come down from the high area to the six- thousand-foot level to gather the water hyacinth and other plants to obtain the ashes from these and other iodine carrying plants to carry back to her children to prevent, as she explained, the formation of “big neck,” such as she had. The people living at the six-thousand-foot level also use the ashes of these plants. Among many of the tribes in Africa there were not only special nutritional programs for the women before pregnancy, but also during the gestation period, and again during the nursing period. For the Indians of the far North this reinforcement was accomplished supplying special feedings of organs of animals. Among the Indians in the moose country near the Arctic circle a larger percentage of the children were born in June than in any other month. This was accomplished, I was told, by both parents eating liberally of the thyroid glands of the male moose as they came down from the high mountain areas for the mating season, at which time the large protuberances carrying the thyroids under the throat were greatly enlarged. Among the Eskimos I found fish eggs were eaten by the childbearing women, and the milt of the male salmon by the fathers for the purpose reinforcing reproductive efficiency. The coastal Indians in Peru ate the so-called angelote egg, an organ of the male fish of an ovoviviparous species. These organs were used by the fathers-to-be and the fish eggs by the mothers-to-be. This entry was posted on Friday, June 27th, 2008 at 12:45 pm and is filed under General Rants, Minerals- Iodine Iron Calcium Magnesium etc, Pregnancy. You can follow any responses to this entry through the RSS 2.0 feed. You can leave a response, or trackback from your own site.